My son turned 11 six months ago this week. I remember the night he was born, in our upstairs bedroom in a little red farmhouse in Massachusetts. He was a peaceful baby, patient with my insecurities. I bonked his head once, by mistake. He startled but didn’t cry. I did, worrying in my postpartum haze of hormones that I didn’t deserve such a calm, easy baby. Back when my son was born, moms who had 11 year olds seemed ancient. The author’s son, age 11. Photo by Jennifer Margulis. How did he get to be so old? He has big feet, like a puppy. His grown-up front teeth are too big for his mouth. I imagine he’ll grow into his feet and his teeth. And probably sooner than I’m ready for him to. These days he’s all energy and elbows. He talks too loudly, bounces balls incessantly inside the house, sneaks up on me in the morning (before coffee) and shouts “BOO!” at the top of his lungs, and generally finds a thousand ways a day to drive us all crazy. We fight about homework and chores and who fouled who at the pick-up Sunday basketball game. I still feel privileged to be his mom, even if he’s anything but patient with me these days. When kids are little it’s easy to buy them presents, but when they turn eleven it’s harder. 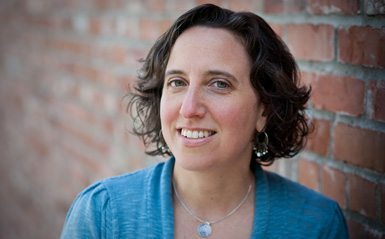 I polled moms with older kids, asked my Facebook peeps, and talked to my husband (who, after all, was himself an 11-year-old boy once) to figure out what to get my son for his 11th birthday. A money pizza is a perfect present for an 11-year-old boy. Photo by Jennifer Margulis. My son loves money. I imagine every 11-year-old boy does. He loves to collect it and he loves to spend it. Money is a perfect present for an 11-year-old boy but giving money as … money … is no fun. So we made our 11-year-old boy a pizza out of bills and coins. 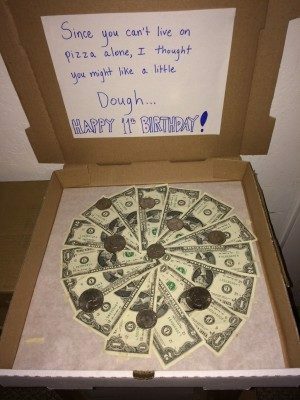 A friend gave me this idea: Get an empty pizza box, write a note on the inside cover: “Since you can’t live on pizza alone, I thought you’d like a little dough.” We made our money pizza with $1 and $2 bills. The “toppings” were silver dollars, half dollars, and gold Susan B. Anthony coins. We taped the bills to the bottom of the box with folded over masking tape. The grin on his face when he opened the pizza box was as wide as an extra large pie. 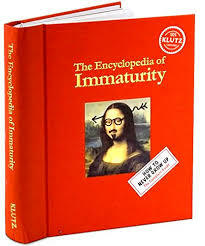 The Encyclopedia of Immaturity is one of the best books ever written if you like practical gags, clever costumes, and silly jokes. A perfect gift for kids of any age (I bought a copy for my older brother when he was turning 43), but an especially perfect present for an 11-year-old boy. If you’re like the average American family, your kids already have way more stuff than they can play with. Instead of buying your son a present, get him an experience. This gift can get a little pricey but a one-hour, half-day, or all-day trail ride on horseback is an unforgettable present for an 11-year-old boy or girl (and creates no clutter). If yours is a winter baby, take him on a snowshoeing adventure. If you’re like the average Amer—right, I already said that. A new zipline adventure park opened recently about an hour from where we live. My husband took my son on a surprise outing to go ziplining. Half the fun for my 11-year-old boy was trying to guess where they were going. My friend who lives outside of New York City declares a “Marcus Day” twice a year. Instead of walking her son to school, she walks him to the subway and they head into the city for a day of sightseeing and mother-son bonding. If your son’s birthday falls on a school day, finagle the day off from work and spend the day with him instead. Your time and attention are often the best present you can give your child. Remember how badly 11-year-old Henry Huggins wanted a genuine leather football and how many worms he had to catch to make the money to pay back his friend after he threw the football in a passing car’s window? Kids like footballs. Especially 11-year-olds. Also good for playing four square, and kickballs are remarkably affordable. A soccer ball, if your 11-year-old boy doesn’t already have one, makes an awesome present too. If you’ve never opened a savings account for your son, bring him to the bank with you to open an account. He’ll feel very grown-up talking to the bank manager and signing all the papers. You can kick off his savings account with $11 or $111, if you can afford it. Our favorites include the My Side of the Mountain books (the outdoor adventure of Sam Gribley and his peregrine falcon Frightful), The House of the Scorpion (these two are pretty disturbing but exquisitely well written), and Hatchet (a lost-in-the-wilderness story from the point of view of a young boy whose parents are divorcing). If you have older kids, here are 12 suggestions for books to read with 12-year-olds. I got my first skateboard when I was about eleven and we spent a year in California. They were all the rage on the West Coast back then. My skateboard was sky blue with a picture of a twenty-something doing a handstand on the deck. Skateboards are awesome for any age. If your son already has one, consider a unicycle. American kids these days are dangerously vitamin D deficient. Presents that encourage your kids to spend more time outside (see #3, #4, #6, and #7) are a win for everyone. My son loves to make things out of wood. Yours might too. Plus if your 11-year-old boy has his own set of tools, you can put him to work on fix-it projects around the house. 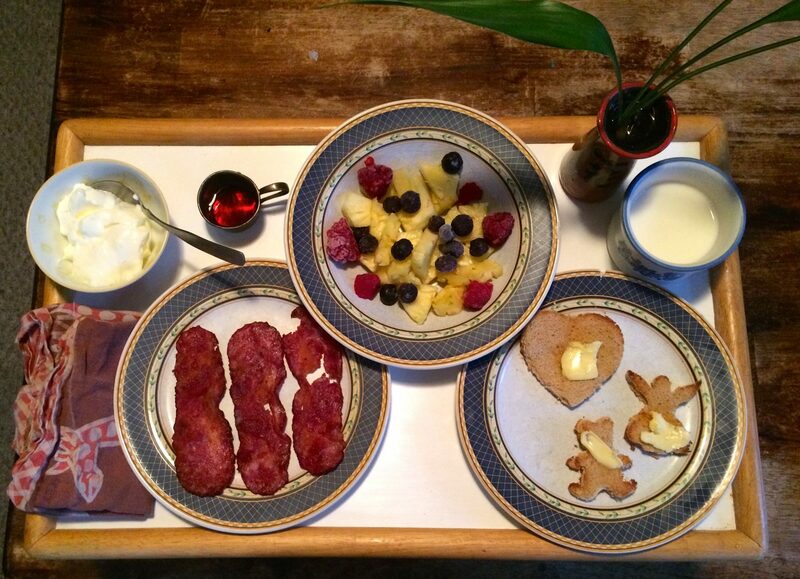 Breakfast in bed is a great present too. Photo by Jennifer Margulis. N.B. 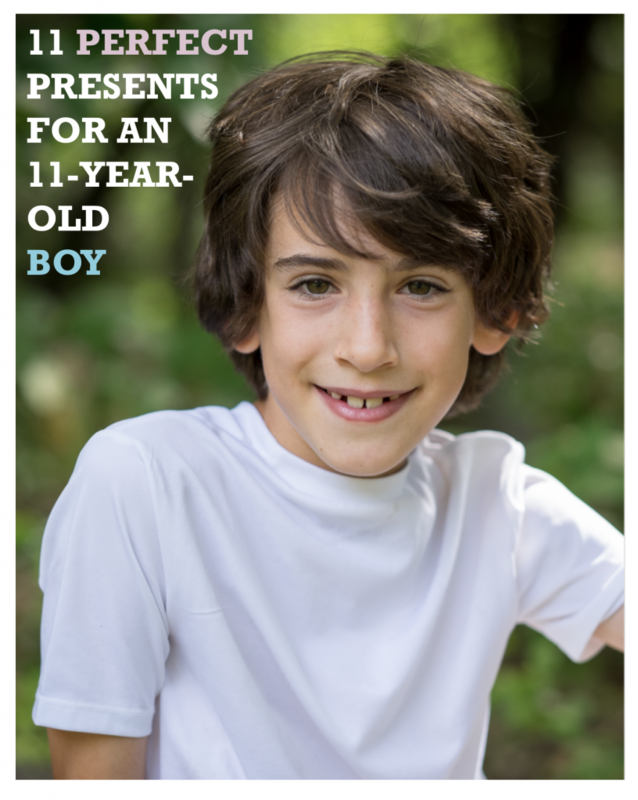 : I had a hard time coming up with gifts for my son’s 11th birthday, so I wrote this post to make it easier for you than it was for me. I hope it inspires you to find your son the perfect gift(s)! What was your son or daughter’s favorite 11th birthday gift? We’d love to hear YOUR suggestions in the comment section below! Great post. I just ordered the book and will be making a money pizza. thanks for the ideas! I love the money pizza idea! I have three boys (who love money) I am definitely doing that for their next birthdays! 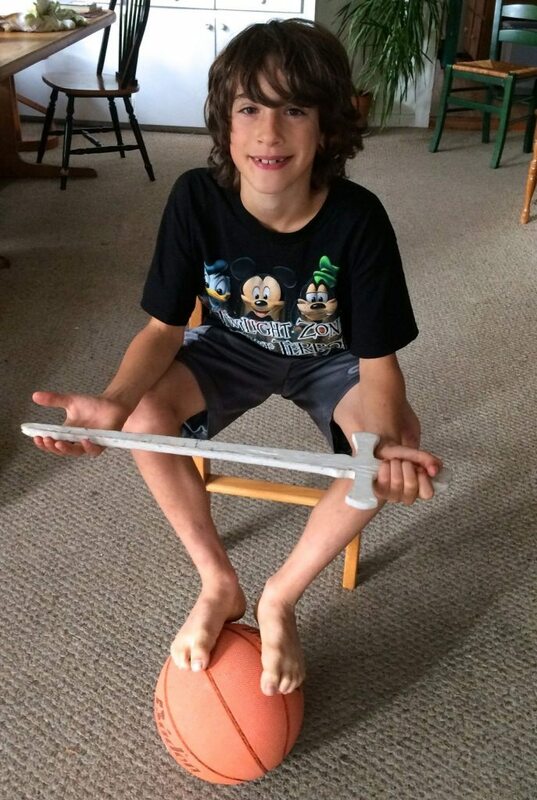 Its not an 11 year old b-day but maybe could be… when each of my older boys turned 12 we bought them their first knife. A nice quality wooden handled folding Buck knife that is a handy thing to have in life. We figured that they were old enough to handle the safety and responsibility. We had them engraved with their first and middle names, “12 years” and the date of their 12th birthday. My son is 39 and I still have trouble figuring out gifts for him! My daughter is so easy: jewelry, clothes, tickets to dance concerts, things for her kitchen. Your suggestions were wonderful. My son would have loved the money pizza. Actually, maybe he still would! This is so sweet! I have only girls but want to have another baby now! Actually, my girls would love these (maybe not the football) and, come to think of it, these are great gift ideas for my husband, too!! It’s so fun re-reading this. I’ve used the money-pizza idea with both my boys. Now, they are 14 and 16, and experiences are still fave gifts for the whole family: horseback rides, rafting trips, the (relatively) new Escape Room in town. Though since they are teens and their social lives are super important, I like to include their friends as well. Thanks for this great and timeless post! Hi, I am grandma to Andrew.I, too, like the money pizza. Andrew is a big brother, good student and a reader and is a musician. He and I took to each other from day one. I’d like a time machine to go back to the time before the divorce; to the time when I could laugh and play with him at anytime. We are still buddies. Your site is personal and rates a 10 with me. 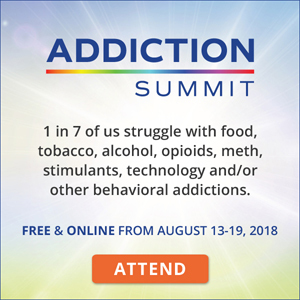 I will pass on your site to my friends. Jill W.